Throughout this heartfelt writing, Dee Taylor backs her newfound edification with biblical Scriptures that resonate truth in her own spirit. You will find her writing informative, thought provoking, and with new enlightenment, as she brings along the reader on a walk to the other side with her oldest child and her mother-in-law, who both had terminal cancer. Book Dee Taylor For Your Next Event! Dee Taylor is founder and owner of "SomeWhere In-between," a Texas based company dedicated to speaking to corporate managers, caregivers and coaching speakers. Taylor’s passion is specializing in guiding owners or managers of companies on how to "fold in" or enhance eldercare policies into their overall existing benefits and policies packages. Read chapter summaries and other things that Dee believes you may want to know....Click here. If you are an author in need of help proofing and copyediting, book interior formatting/typesetting, or creating a press-ready files, please visit Christian Book Format. Kathy is a highly gifted gal and you can't go wrong hiring her for your project. 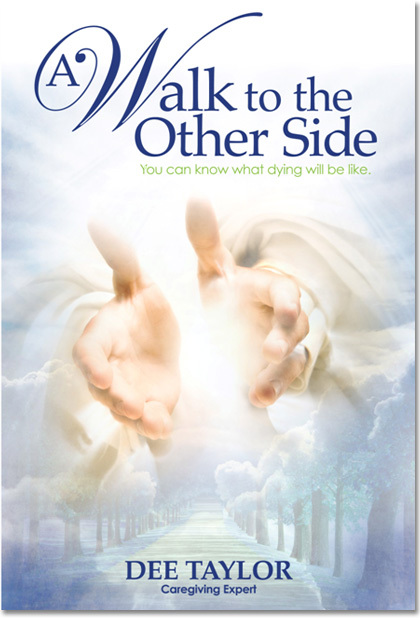 JOIN DEE IN THE CONVERSATION ABOUT DEATH AND DYING! 1/16/13 - KENW 89.5 FM @ 3pm Central Time in Portales, NM & TX with Host, Dr. James Lee. 1/18/13 - KCMN -AM 1530/KCBR-AM 1040 with Host Tron Simpson in Colorado Springs, CO @ 8:15am central time. 1/29/13 - issues with Host Walt Shaw taping from Sacramento CA for 5 CBS stations in the CA market @ 1:00pm, central time. 3/13 - Syndicated show and simulcast on internet. to five stations in Sacramento, CA Host: Walt Shaw on " Issues with Walt Shaw"
Dee Taylor quoted in Standard-Examiner article, Ogden, Utah 12/22/12 following tragic shooting of 27 people inConnecticut.